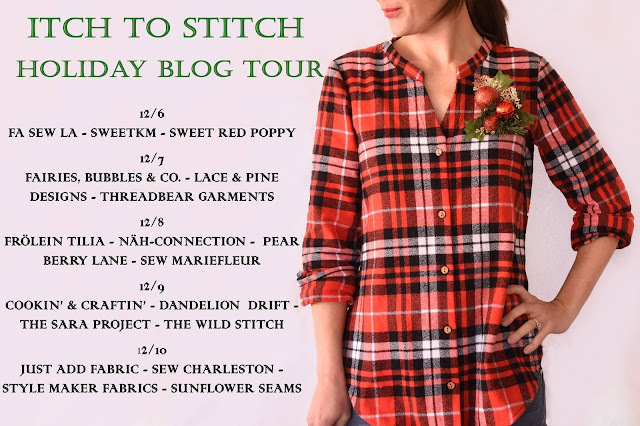 Today is the opening day of the Itch to Stitch Holiday Blog Tour hosted by Fleurine and Leslie, and sponsored by Style Maker Fabrics. I paired the classic Hepburn Turtleneck pattern with this luscious, black stretch velvet. I've been wanting to make a turtleneck dress for a while, and this was the perfect opportunity to make it a priority. The Hepburn Turtleneck pattern is shirt length, with long or 3/4 length sleeve options, and it is quite form fitting. The pattern is written with negative ease (smaller than your body), I thought that might be a little too snug across the bum for my taste, so I went up a size. I did my normal grading between bust, waist, and hip sizes, but a size bigger. I'm really happy with the fit through the shoulders, and I love the super slim sleeve. To lengthen the pattern into a dress with a straight skirt, I simply dropped the hem 16", and flared it a scant 1/2" on the sides. I also added 2" to the length of the collar. All of these changes were tested out in a stretch french terry muslin first, so I could be certain of the fit before I started. Style Maker Fabrics has a great selection of knits that would work for a dress like this. I was tempted by the sweater knits, but decided to go with something a little fancier for the holidays. The stretch velvet is the perfect fabric for this style (don't miss the other lovely colors!). The pile gives it a nice body, it has 100% stretch, and a nice drape. I used a solid 2 1/2 yards to make this dress. I relied heavily on the Seamwork Magazine Beginner's Guide to Sewing Velvet. If you've never sewn with velvet before (which I hadn't) you'll want to do a little research before you begin. Itch To Stitch is offering 16% off patterns until December 11 with code HOLIDAY16! Style Maker Fabrics is offering $5 US shipping, no coupon code needed! Follow along with the rest of the blog tour on Leslie and Fleurine's blogs! Or on instagram #itsHolidayBlogTour. Trust me, there is some really good stuff coming this week! Thanks Meg! Seamwork is always a great resource. Such a beautiful and classic black dress! I really want to sew something with velvet now... Thank you SO much for participating! Thanks for inviting me Fleurine! I love the dress hack you did! It fits you beautifully and is gorgeous in that velvet fabric. Thanks Teri! I love a pattern that I can bend to my will! :) I've got a few more modifications in mind, this would look great with a longer fuller skirt. This hack is great! I'm a total sucker for turtlenecks in general and would go for this look everyday if I could. The velvet is so classy and lives up to the pattern name. Well done. I agree! Definitely lives up to the "Hepburn". I'm on the look out for a more casual fabric to make another one in. It would be a great layering piece. I've been looking for a good turtleneck pattern from an Indie company. Thanks for reviewing this one! I definitely recommend this one! I also have the Seamwork Neenah, but I haven't tried it yet. What a great hack! It looks lovely on you, and now I'm off to go read up on sewing with velvet! Thanks Emi! Stretch velvet is surprisingly easy to sew with, and very comfortable to wear! Thanks for all the helpful tips and your photos are gorgeous - I love the idea of a turtleneck dress and yours is definitely an inspiration! So lovely! It looks so comfortable! love this dress. looks so gorgeous. We have a great collection of African fabrics. Good quality at lowest price. For whole sell price Visit us hope you guys love them. That dress is just wow! Looking forward to stitch the same one for me! We also do some sewing work at home to turn some fabric into fancy stuff! We have got the best Candid Wedding Photography team based in New Delhi,INDIA. Thanks for the information. We have got some great Indian Wedding Photographer team! Please feel free to give us a look! Hey guys! Sewing work could never get boring.. I still do sewing work. and do the Wedding Photography work as well. Not just this but normal photo shoot as well. Hey! I have read all your Blog this So Nice and Awesome service you have provided, I learn many new things from here and want implement my website. If you are also Know for Dress maker Birmingham related to this then visit my website.